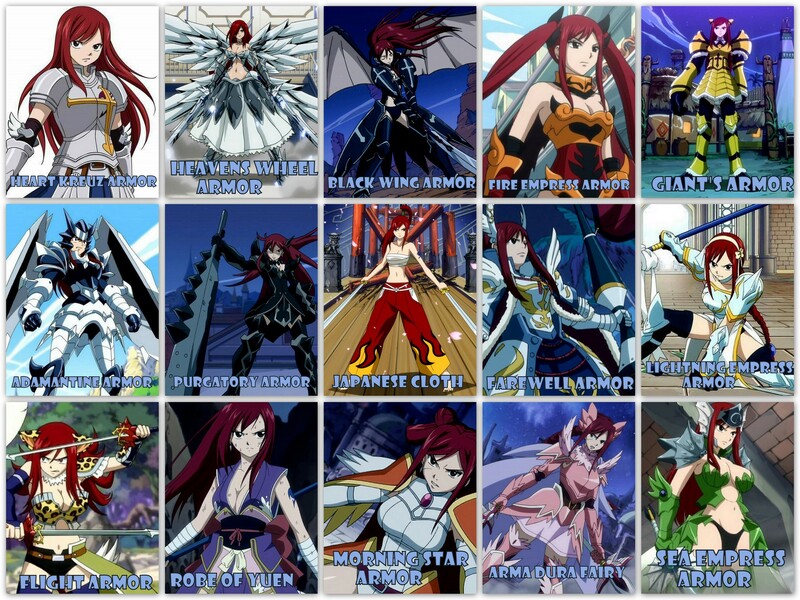 ERZA'S ARMORS. . HD Wallpaper and background images in the Fairy Tail club. This Fairy Tail wallpaper might contain аниме, комиксы, манга, анимационные фильмы, комикс, мультфильм, and книга комиксов. She's my favorite female character. ERZA's Cool.. I like the Black Wing and Purgatory armor. never realized she had so many armors.COOL!!!!! Wendy is realky awesome too.She can beat Max,Warren and the rest any day. Its just my opinion though,haha.Is it weird? For me, she's one of the strongest female mage in her time... I wish, she will acquire new ones still. My favorites are Purgatory,Heaven's Wheel, and Black Wing.